Young Americans Schools of Self-Defense - Personal attention and instruction is given to each child in the class by our black belt instructors. This kick by one of our blackbelts is being judged for technique. 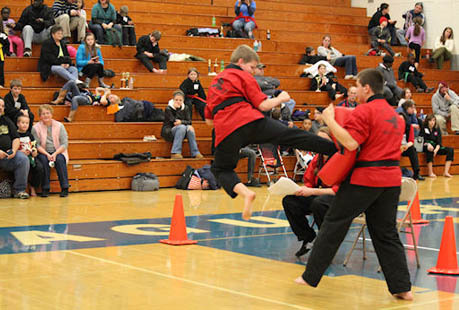 Sparing allows the student to utilized the karate/self-defense techniques they have learned to defend themselves in a controlled, mock attack situation. All of the Young Americans Schools of Self-Defense instructors hold a black belt, and have been teaching in the martial arts for many years, which allows for quality instruction for every student. 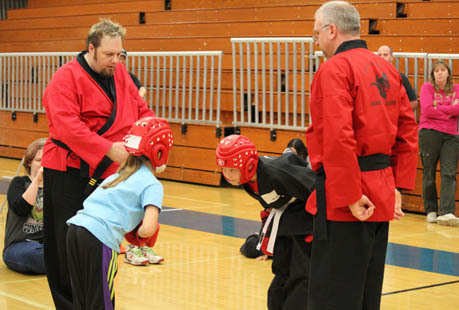 Personal attention and instruction is given to each child in the class, training them in the skills they need to help defend themselves in an threatening situation, and to compete in optional martial arts competitions. We will teach students the skills and techniques to effectively defend themselves in dangerous circumstances. We also help instill the sense of personal confidence necessary to cope in any threatening situation. In partnership with the parents we teach that by eliminating weak and indecisive movements via karate/self-defense training we help the student eliminate fear and indecision. This empowers the student to feel confident to take whatever action that is required to effectively cope with any threatening situation. For more information about our program, check out our program information sheet.